Elsa Bosi at CSO Yachts is offering CRN's 43m motor yacht Magenta M for charter next summer in the Eastern Mediterranean. Built in 2001, Magenta M recently emerged from a full refit and offers accommodation for 10 guests in five staterooms cared for by nine crew. 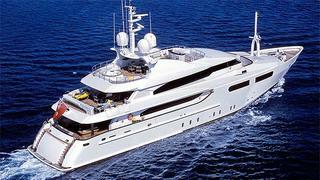 Large deck spaces and a spa pool are perfect for entertainment or relaxation and she has a wide range of water toys. Based in Greece, Magenta M is available for charter from April 2013 at weekly rates from €140,000 in high season and €130,000 in low season.